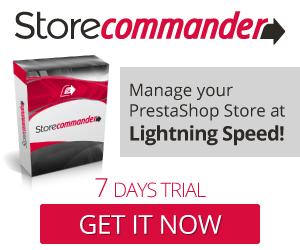 Manage your PrestaShop at the speed of light with Store Commander ! Store Commander offers a high-speed ergonomic interface on a single web-page: exit endless scrolling into Prestashop back office! The Free version covers catalog management, categories and also products properties management. All features you have access to are in black and all the others are in blue in read-only mode. Edit your categories in bulk with the copy/paste feature by changing their name and descriptions. Optimize SEO management and save time using the copy/paste feature. Enable or disable products in bulk associated to selected categories. Associate an image to one or multiple categories. Manage all the languages and translations. You can upgrade your free version to one of our Solo or MultiShop offer that will bring you over 300 mass-management features to mass-update and mass-edit discounts, prices, orders, customers, multiple stores, advanced stocks, accessories, and much more! Store Commander is compatible with our cache module: Cache Manager. Each change made from Store Commander delete the obsoleted product's cache, so your store is always up to date ! It is also compatible with our module Multiple Features, which let you to assign more than one feature value to your products.